Separate yolks from whites of eggs. Beat sugar and butter together and then beat in egg yolks. Mix baking powder with sifted flour and gradually add to creamed butter, sugar and egg mixture; mix to a soft consistency with milk and orange juice. 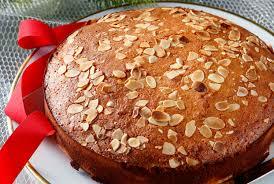 Now add the almonds and lemon rind. Beat egg whites until stiff and carefully fold into the mixture. Bake in a well-buttered, large cake tin for at least 1 hour at medium heat. Remember the silver coin. Wash it well with salt and lemon and stick it in the mixture just before you put it in the oven. In olden days it was a gold one! Beat butter and sugar well. Sift together the flour and baking powder and add the spices. Gradually mix into the creamed butter and sugar. Add the water with baking powder solution, to form stiff dough. Form the mixture into a round loaf and cover it with the blanched sesame (which you bring to the boil in water before using). Place in a buttered baking dish and bake in a slow oven for about 2 hours. Wash a silver coin well with salt and lemon and stick this into the loaf either before or after baking. 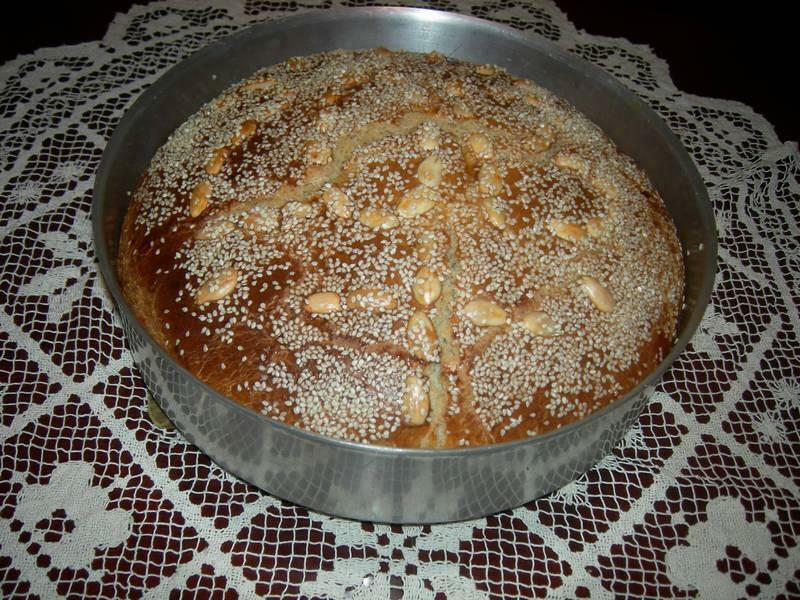 You may, of course, form a number of small loaves or rounds instead of making a big one, or make variously formed figures, (animals, birds, S, rounds, etc). Syrup: bring ingredients to the boil and skim off foam. Boil for 2-3 minutes. As soon as the melomakarona come out of the oven, pour almost cold syrup over them with a spoon and sprinkle with ground almonds. Thaw phyllo pastry and separate sheets according to package instructions. Place half of pastry sheets in a greased 15x10x1-inch baking pan, one by one, brushing each sheet quickly and all over with melted butter. 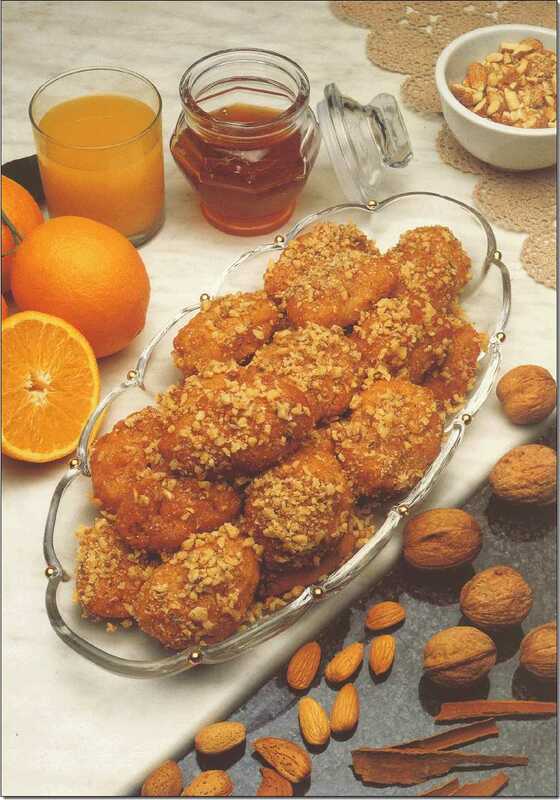 Combine nuts, 1/2 cup sugar, and cinnamon; sprinkle over buttered pastry. Place remaining sheets on top, brushing each with melted butter. 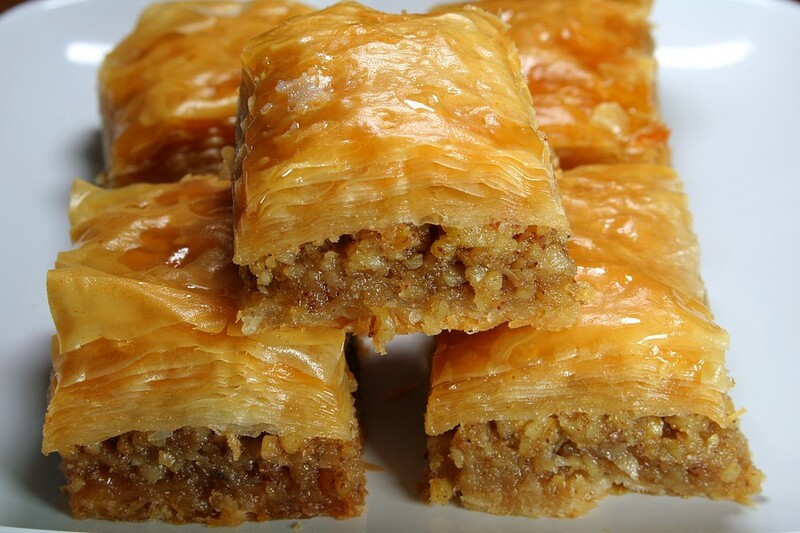 Cut baklava pastry into 2-inch diamonds. Bake at 400° until brown and crisp, about 30 to 35 minutes. Meanwhile, in a saucepan, combine remaining 3/4 cup sugar, honey, 1 cup water, and lemon juice; bring to a boil. Boil baklava syrup for about 20 minutes, stirring occasionally, until syrupy. Cool and pour over baklava. Wait several hours before you serve and enjoy it. For the dough, sift flour into a large bowl. Stir in the yeast, salt and sugar. Add the oil and enough water to make it firm. Knead for at least 5 minutes until it has a smooth and elastic feel. Put the dough into a plastic bag and leave in a warm place for an hour to rise. For the filling, coarsely grate the cheeses, add the flour and baking powder then gradually stir in the beaten egg and seasonings until you have a stiffish paste (if the mixture becomes runny don’t use all the beaten egg). Divide the dough into egg sized pieces and roll these into 4” (10cm) discs. 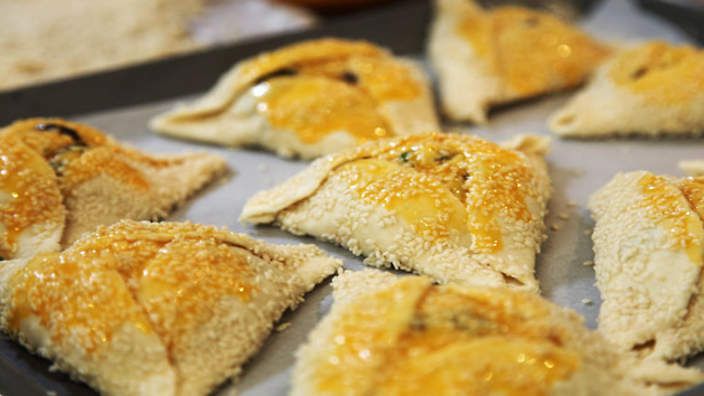 Place a generous tablespoon of filling into the centre of each pastry disc, spreading it slightly. Pull dough up at 3 points to make a triangle, or 4 points to make a square. You should still be able to see the filling in the middle. Press corners together to seal and leave to rise. Just before baking, brush with beaten egg and sprinkle some sesame seeds over them. Bake in a hot oven gas 8, 450’f, 230’C for 12-15 minutes until cheese filling is puffed and flaounes are golden. Serve hot or cold. Makes about 12. 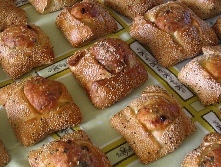 This dish is a Cypriot favorite, certainly a favorite recipe for kids. If you make this for your youngsters, you shouldn’t have any problem with them eating their food! Sauce – Place the oil in a shallow pan and when it is moderately hot, add the onion. Fry gently for a few minutes and then add the mince. Stir well and continue to fry for 5 minutes. Add the chopped tomatoes and the tomato paste. Add the cloves, cinnamon, salt and pepper. Finally, add 500ml warm water. Cook for about 1 hour, until you have a thick sauce. While the sauce is cooking, boil a deep pan of salted water and add the pasta. When the pasta is ready, drain it and return it to the pan (having removed the water) with a large knob of butter, off the heat. Stir the pasta, sprinkle the nutmeg over it and prepare the béchamel. 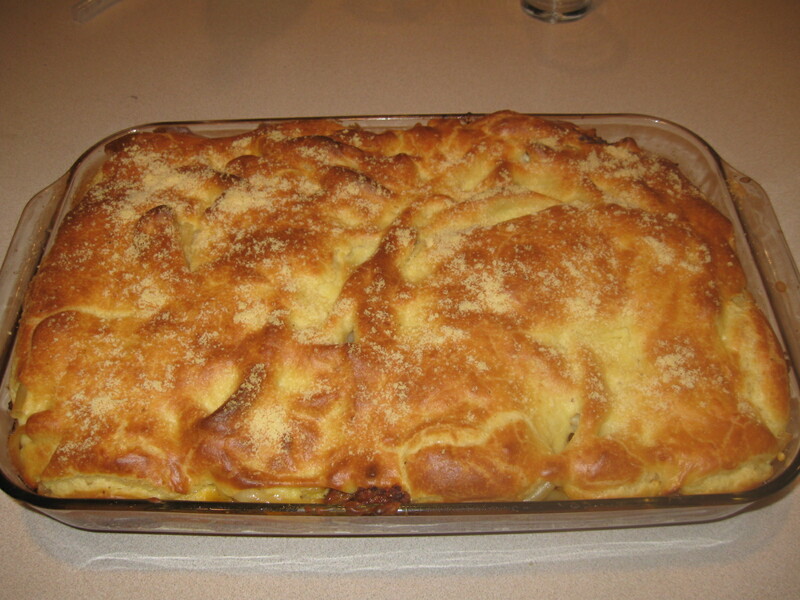 Béchamel – In a heavy-bottomed pan gently heat the butter until it melts. Add the flour and stir continuously. Add half of the milk and continue to stir with a whisk. When the mixture starts to thicken, add the rest of the milk whilst stirring continuously. When it starts to thicken again, lower the temperature to the minimum and add the grated cheese. Add 3 large spoonfuls of béchamel to the pasta and mix. 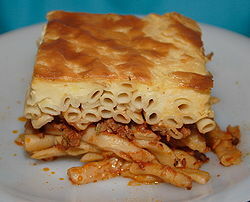 Place half of the pasta mixture in an oven dish 35cm long and 5cm deep. Add all of the sauce as another layer on top of it. Add a further layer with the remaining pasta. On top put all of the béchamel. Bake in a preheated oven for 45 minutes or until it has a golden brown color.